We are mid-summer. The days are long and we are outside working and playing in the heat and humidity. During these hot days, you may find yourself feeling overheated, lethargic, and without much appetite. Chinese medicine calls this Summerheat Syndrome – a disorder associated with exposure to high temperatures and humidity. Symptoms could include excess body heat, red face, profuse sweating, dry mouth and throat, dizziness, headache, loss of appetite, or nausea/vomiting. Staying hydrated can help you avoid Summerheat syndrome. We’ve all heard the advice to drink eight 8-ounce glasses or drink half your body weight in ounces of water each day. But what if you don’t get thirsty? Is it good to force yourself to drink this much water? Chinese medicine says to drink when you are thirsty and to avoid iced drinks. Drinking an excessive amount of water and consuming iced drinks can weaken our digestive qi. As a general rule, Chinese medicine recommends drinking room temperature water according to your thirst. For many of us, drinking plain water is not appealing and it can be a struggle to drink enough. While drinking water is important, the water content of foods can also help meet your hydration needs. 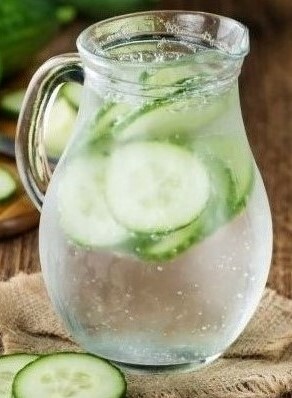 If you drink water when you feel thirsty and eat water-rich foods, staying hydrated won’t be a problem. Eat vegetables and fruit with high water content. Cucumbers, lettuce, celery, radishes, zucchini, yellow squash, tomatoes, bell peppers, asparagus, portobello mushrooms, swiss chard, cabbage, cauliflower, turnips. Grapefruit, watermelon, strawberries, cantaloupe, honeydew melon, peaches, Asian pears, blackberries, papayas, nectarines, pineapples, plums, oranges. Drink tea. Get the added benefit of the antioxidants. Green and white tea are refreshing choices for summer hydration. Mint, hibiscus, chrysanthemum and sour plum are also top choices for hot weather. Simply add tea bags to room temperature water for a quick drink. Make it more flavorful. Add a splash of lemon, lime, tart cherry, or pure cranberry juice. Try adding fruit – sliced strawberries or citrus, raspberries, and blackberries make tasty infusions. Try soups and broths. Get your water and other nutrients in one stop. Chilled soups are a great way to use fresh ingredients from the garden and are easy to prepare in advance. Drink coconut water. Coconut water is rich in electrolytes and useful for rehydrating after outdoor activity in the hot weather.